Save big on the best games magazine in the world. Subscribe to PC Gamer this Black Friday weekend and save a massive 43% on the usual price. This gets you a year's subscription to our award-winning games magazine for just £45. 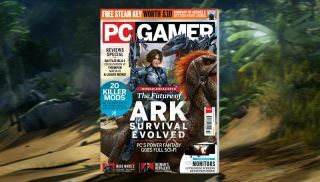 Every issue of PC Gamer UK comes packed with exclusive features on the biggest PC games and PC gaming culture, as well as reviews, previews and free download codes. Each UK issue comes with gorgeous exclusive subscriber covers, too. To get this amazing deal, simply head here then enter the code SALE20 at the checkout to receive an additional EXTRA 20% off our already discounted price. It's an ideal Christmas present for a loved one, or, much more likely, yourself. Take a look at the pages below to see how absurdly pretty it looks inside. The making of the seminal Lady Boyle's Last Party level in Dishonored. We did a whole feature about gaming toilets. The Ark cover feature from issue 298. The making of Hitman's Sapienza level from our latest issue.